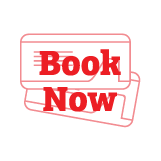 Contact us today at 800-544-2299 or email us to reserve this tour. 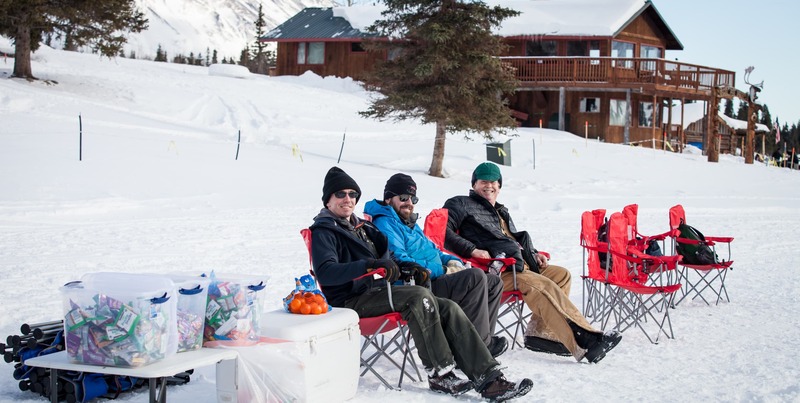 Day at remote checkpoint to watch mushers and teams. Prepare for a great trip! Dress in layers with warm boots, gloves and hat. You will be spending majority of the day outdoors. You will be on a plane for about 1 hour 15 total so we recommend using the restroom before the tour. 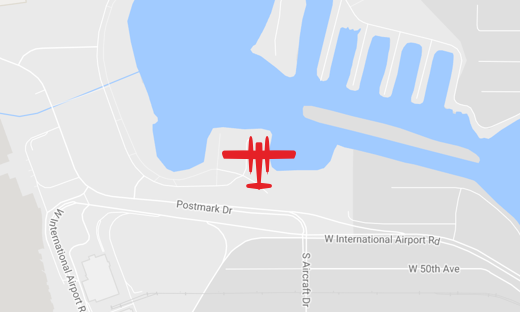 Rust’s restrooms are located in the hanger building, the red doors across from the office. Remember to charge your camera batteries and ensure that you have enough video. Strap cameras and valuables to yourself before getting in and out of planes and while on the ground at the checkpoint. It’s ok to bring a non-messy, non-smelly snack with you. If you had a great time, you are welcome to tip your pilot. Leaving Anchorage approximately 10:00 am and returning to Anchorage approximately 5-6pm. 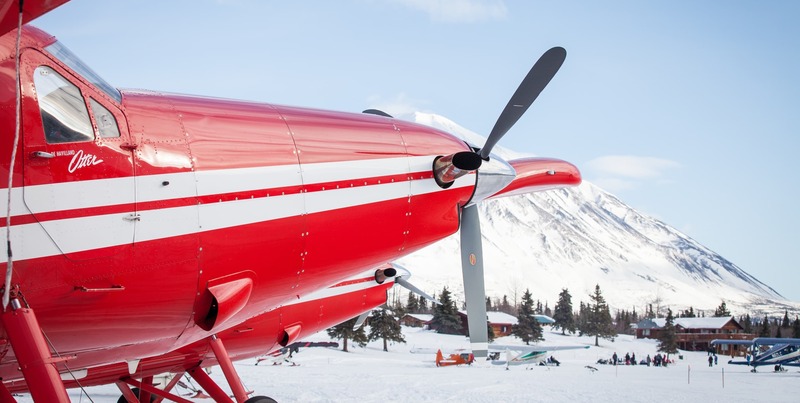 Join Rust’s Flying Service in 2019 to “Chase the Race” up the Iditarod Trail to the 4th checkpoint at Rainy Pass Lodge. We’ll depart Anchorage, Monday, March 4, following the Willow re-start and pick up the trail near the Skwentna checkpoint and follow it as it climbs to Finger Lake, then up the Happy River Steps to the Rainy Pass Check Point at Puntilla Lake. 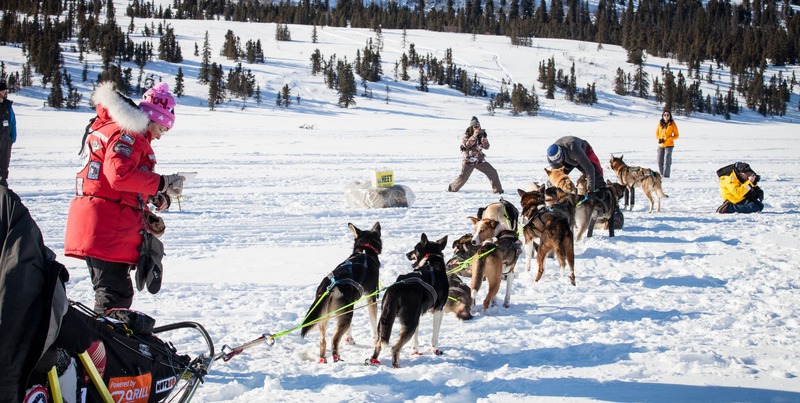 You’ll be in the middle of the action as the mushers and their teams arrive at the checkpoint. 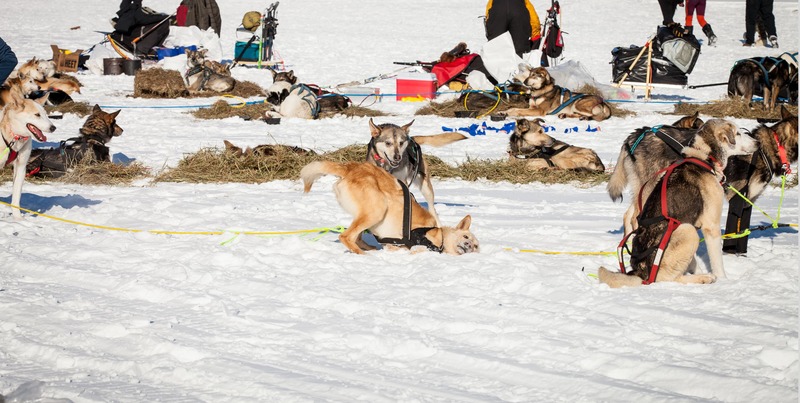 Witness mushers laying down hay, feeding their dogs, and taking a bit of a breath before continuing on the trail. Few have the opportunity to enjoy this type of up close and personal view of the race!